This mad weather has created in me a desire to plant in the garden, but I know it is a trap. I know at any moment a cold snap will descend upon me like a vulture and rob me of my tender seedlings! What is a gardener to do? For starters you could purchase a VegTrug. This is what I did and I like it! 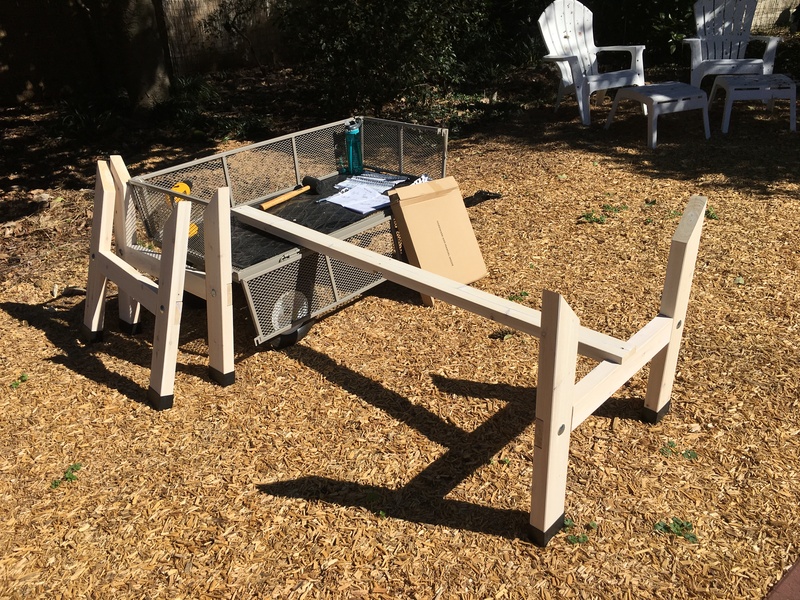 I wanted to add more growing space to the kitchen garden area, but I wanted it to be movable (as long as the dirt is removed) and raised off the ground. I intend to use it mainly to grow lettuce, carrots and strawberries during the season. The reason I feel it would be good for lettuce is it is high enough off the ground to keep it away from rabbits, slugs and other critters that may dine sumptuously upon thy harvest. It’s also at a great height that harvesting and weeding would be easy! A quick planting, some of which will be moved to the potager in spring. 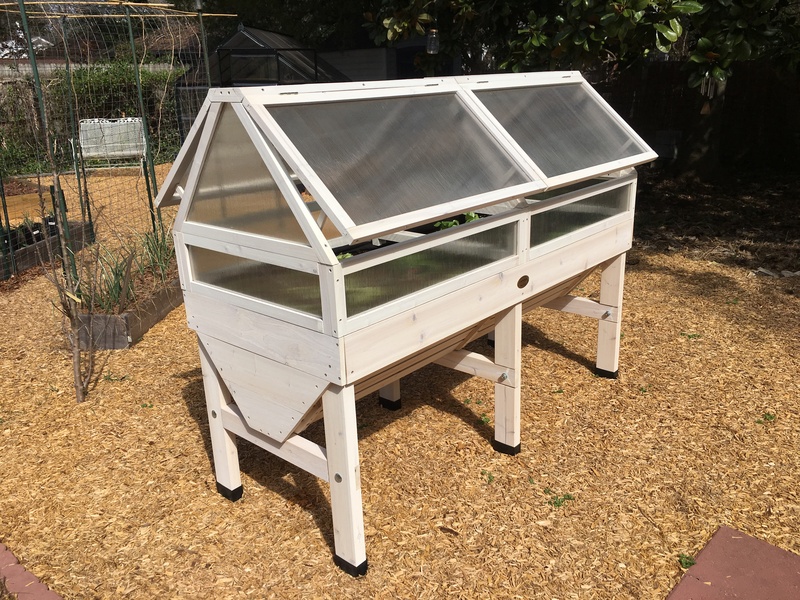 I ordered the cold frame kit to go with it so that I can start vegetables early as well as late into the season. In addition to the lettuce I also planted tomato, broccoli and basil. All of which are getting their head start in the VegTrug and will be transplanted into the potager once spring actually arrives. When the season is in full swing you can remove the cold frames. I intend on placing them on the ground near to the greenhouse and continue to use them for other plants. I would rate the VegTrug highly and worth the expense, but I feel it would be best if they upgrade to the use of cedar wood instead of the Fir wood they use. Some of the pieces did not fit right due to warping of some sections. There are plenty of cracks and spaces where the weather will find itself entering into and messing with the soft Fir. It does suggest in the instructions that the VegTrug will require yearly maintenance, which is more or less common sense since it is made of wood. Overall, it is a wonderful product and a great addition to the garden. 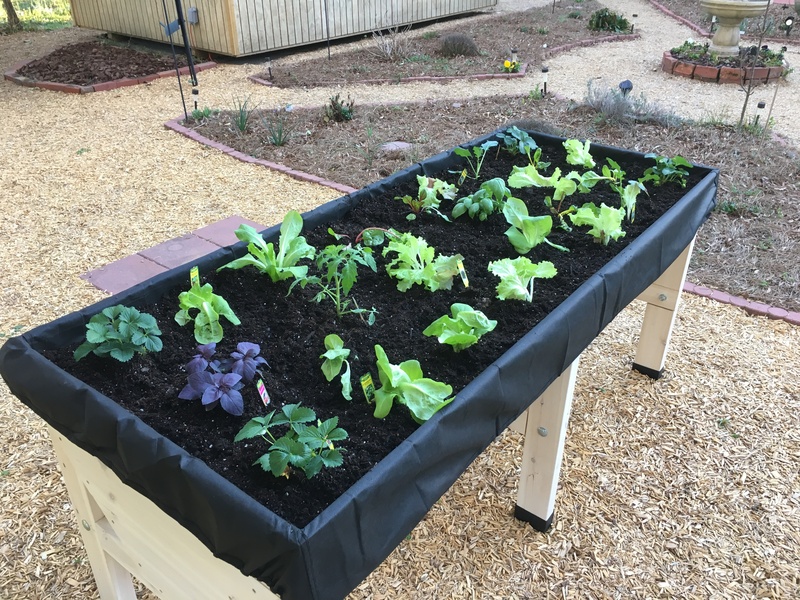 Completed VegTrug with a cold frame kit. Impressive! 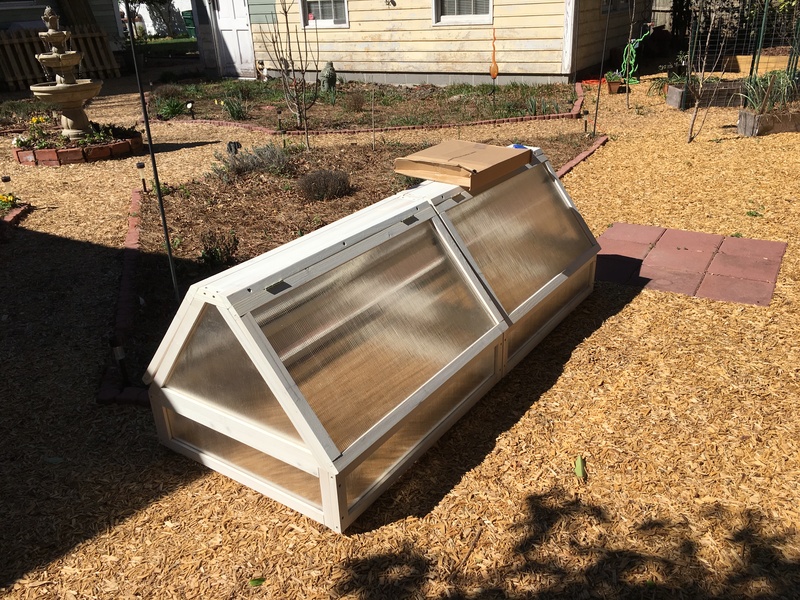 I didn’t know there was an option for the cold frame. May need that for my deck! Yes, it’s wonderful. The weather has snapped back to winter since I posted about this. Everything is getting on fine under the cold frame. Very pleased. how does this hold up in bad weather, wind etc. Where we are it can be rather stormy and very windy ? So far so good, but I have noticed the finish already wearing away. However, I think the white wash is a milk paint wash. I expect next season I will be treating it with some type of food grade sealant. Thanks for the feed back. I then will attempt to make one myself with more sturdy materials. Also the wood appears to be rather ‘thin’. how is the overall quality ? 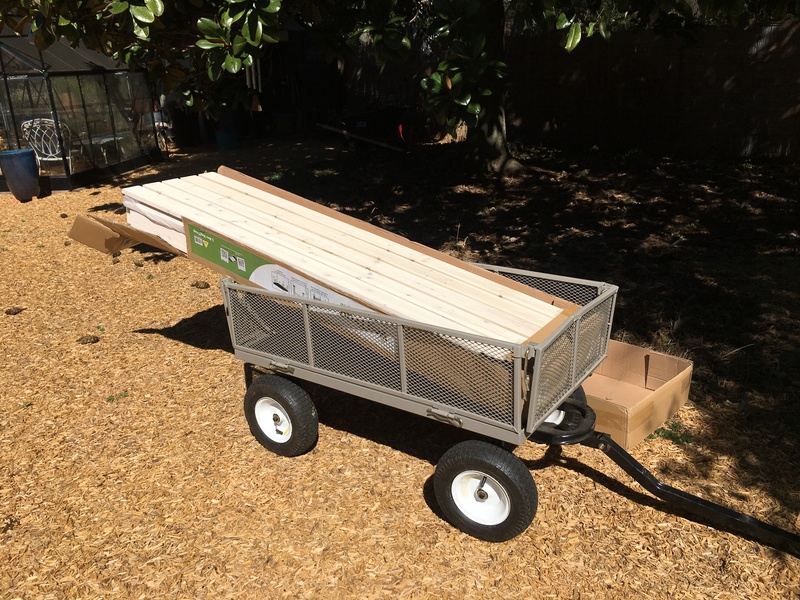 The cold frame framing is made of thin wood. I believe it is Fir. It is quite sturdy, but I can see it needing to be treated after every season to prolong it’s life. Overall I am happy with this product.